Travel can truly be a love hate process, and one of the most painful aspects is the packing/airport security aspect of the trip. Essential but if only there was a way to do with out… These disposable pleather tags (complete with those indestructable cable ties) give your luggage that provacative edge to help them stand up for themselves when you’re not there to protect them. 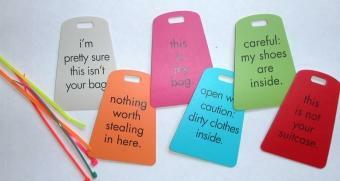 From “Careful: my shoes are inside” and “open with caution: dirty clothes inside” to “nothing worth stealing here” and “this is not your suitcase” - at only 12$ for a set of 6 - the colorful tags will help make your luggage faster to spot, and give it a voice of its own that can change with each mood/journey. Also from Pamela Barsky.